Molly Berry loves chatting with her friends in the pub, and with her grandson on the phone.She enjoys listening to folk and rock music. 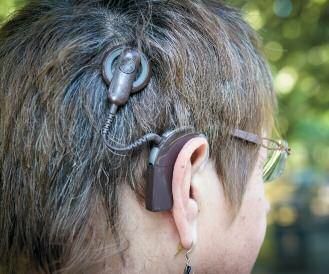 The 63-year-old is also profoundly deaf. Molly (pictured above) is one of around 650 deaf or severely hard-of-hearing adults in the UK each year to benefit from a cochlear implant – a device which directly stimulates the auditory nerve. It has transformed her life. Molly was fitted with her implant, from the manufacturer Cochlear, six years go, when she was in her late 50s. It was a time when she had been ncreasingly struggling to get by with her two hearing aids and also with a connected, although undiagnosed, suspected depression. Molly’s hearing had been failing since her early twenties and by her mid-30s she was fitted with two hearing aids, after an operation proved ineffective long-term or otosclerosis. By the time she reached her mid-50s, life had become difficult, with the hearing aids simply amplifying all sound rather than allowing her to select what she needed to hear. A fun-loving person, Molly’s personality began to change along with her hearing. In the end she avoided the social situations she had previously loved and became increasingly isolated. Living alone, she had relished her social life, but going out in an environment where there was a great deal of background noise and overlapping conversations became impossible. Molly, who recalls frequently walking home from her office job with tears streaming down her face, says: “I have always been outgoing and sociable. I would hold several conversations at once. I loved music, went to rock and folk concerts and to the opera. I knew that losing my hearing meant losing all of that. It meant no longer being part of what was going on. It was very scary. For Molly, living on a narrowboat moored currently on the Grand Union Canal, there were many other challenges, such as not being able to hear if the engine was running smoothly, the directions shouted when manoeuvring a lock or simply engaging in the boating community hubbub. “Life was becoming increasingly difficult and it was exhausting living in a hearing world,” she says. Molly’s story is typical, according to national hearing charity the Ear Foundation, with older people being two and a half times more likely to experience depression if they have hearing loss. And it gets worse. Those with severe hearing loss have five times the chance of developing dementia. Their balance can also be affected and there is a greater risk of life-threatening falls. Despite this, however, older people who could benefit from an implant are often failing to be referred, warns the Ear Foundation’s chief executive, Sue Archbold. “Many older adults who have hearing aids that are no longer effective are unaware they could be considered for the more advanced technology of a cochlear implant. The problem stems from a lack of awareness among the hard-of-hearing community as well as the medical profession they are dealing with. Molly, for instance, only chanced upon the technology when she noticed someone with an implant collecting for a hearing dogs charity in a supermarket car park. This is exacerbated by people generally putting off seeking help for hearing loss, with an average ten-year delay. The reluctance often comes from people believing their hearing isn’t bad enough – an effective test is whether you can hold a telephone conversation – or feeling embarrassed about wearing a visible hearing device. This stigma should be abated, however, with Britain’s ageing population setting the scene for the use of ear technology to become more commonplace. Currently 42 per cent of people aged over 50, and 71 per cent of those over 70, experience hearing loss. However, there is no age barrier – 6000 of the 11,000 cochlear implant users are children and people well into their nineties have had them implanted. Others may be put off by the procedure, which takes two to five hours under a local or general anaesthetic; although complex and delicate, it is relatively straightforward, with the patient generally returning home after an overnight stay. Not everyone will be suitable for an implant, but those who might be interested could well have been blocked by their GP, with 45 per cent of those asking their doctor for advice on hearing problems failing to be passed on for an audiological assessment. And so the Ear Foundation is raising awareness of how important it is for people aged 65-plus to get greater access to cochlear implants. “Hearing is one of the most acute unmet needs in terms of the health of older people today as people face a greater risk from health problems and the social isolation of deafness,” says Sue Archbold. For Molly Berry the choice was a no-brainer. She received her implant at aparticularly difficult time when she felt most vulnerable, having lost within weeks both her sister and her father – for whom she had become the main carer after her mother died suddenly. But as soon as her implant was ‘switched on’ and she could hear every word her audiologist said, she knew her life was back on track. “It was wonderful. I could hear sounds I’d forgotten… the ticking of a clock, my cat lapping her milk, footsteps, the birds. I felt like I could truly engage with the world again,” she enthuses. Even better than that, her experience gave her the confidence to propel herself into a new career. Living on her narrowboat over the previous 20-odd years, she had toyed with casual work in the winter and travelling in the summer, never really finding her true vocation. Having come back from her low-point, she wanted to give something back and has retrained as a lip-reading tutor. Has Molly's experience helped you? Want more information on Cochlear Implants? Online health: Click or Curse? How will our care homes look in the future? The secret killer in your home?